A Better Finder Rename for Mac has long been the file renamer of choice for tens of thousands of professionals, businesses and hobbyists across the world, but that hasn't stopped us from continuing to perfect our product culminating now in the brand-new version 10. The most powerful and complete Mac file renaming application on the market. Download Now for Mac! A Better Finder Rename's huge array of renaming options is organized into 15 intuitive categories that cover all the text, character, position, conversion and truncation features that you would expect from a great file renamer. On top of this, A Better Finder Rename provides more advanced features that answer the prayers of many professionals and hobbyists alike. Digital Photographers in particular will find the advanced sequence number and date & time features a joy to behold. 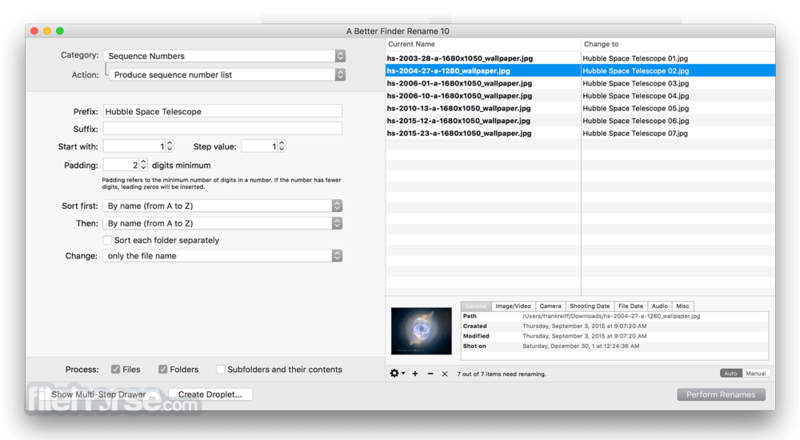 A Better Finder Rename knows how to extract EXIF shooting date and time information from your digital camera images and exploit them in creating sequence numbers or adding time and date information to the file name. Support for all major RAW formats (including JPEG, CRW, CR2, THM, NEF, TIFF, RAJ, ORF , MRW, DNG, PEF, SRF, etc.) extends this to professional photographers. A Better Finder Rename also deals gracefully with multiple shots captured in the same second and gives access to camera and lens meta-data through its tag-based renaming feature. Music lovers will be delighted by our MP3/AAC renaming feature that allows you to exploit the ID3 meta-data embedded in most music files to create naming schemes of your own for your music collection. Meta-data information from MP3, AAC, FLAC, OGG, APE, M4V and iTunes music store files are supported. Instant preview feature displays all changes as you type, making it easy to dial in the right settings and preventing you from making costly mistakes. Version 10's change highlighting feature takes this to the next level by visually marking individual changes. Today's media files come with an abundance of additional information that cannot be glanced from the often meaningless file names themselves. A Better Finder Rename allows you to leverage this meta-data to create more meaningful file names using its tag-based renaming feature. Our renaming engine can read an extensive array of photo, image, music, movie, camera, lens and location meta-data and you can combine this information to implement any naming scheme you can imagine. We don't believe in making simple things unnecessarily complicated. That's why most users will find a single action that does exactly what they want. Sometimes, however, a single action simply isn't enough and that is where our multi-step renaming features comes in. It lets you combine multiple simple actions to create a lean mean renaming machine. Our intuitive multi-step interface, in conjunction with our instant preview, makes it easy to keep track of what's happening. A Better Finder Rename for Mac 10's new Preview Pane allows you to peek inside your files and delve into its meta-data, making it much easier to work with meta-data tags and providing additional confidence in your settings. A Better Finder Rename takes file renaming to a new level of sophistication by introducing an advanced 64-bit multi-threaded renaming engine that solves many problems that other file renamers simply leave unaddressed. The database-backed renaming engine automatically resolves file name conflicts (when several files would share the same name) using a range of configurable parameters. The sequence in which files are renamed is optimized to avoid deadlocks which could occur when the order in which the files are renamed becomes significant. Note: This demo version will allow you to rename only 10 files at a time. Requires 64-bit processor.